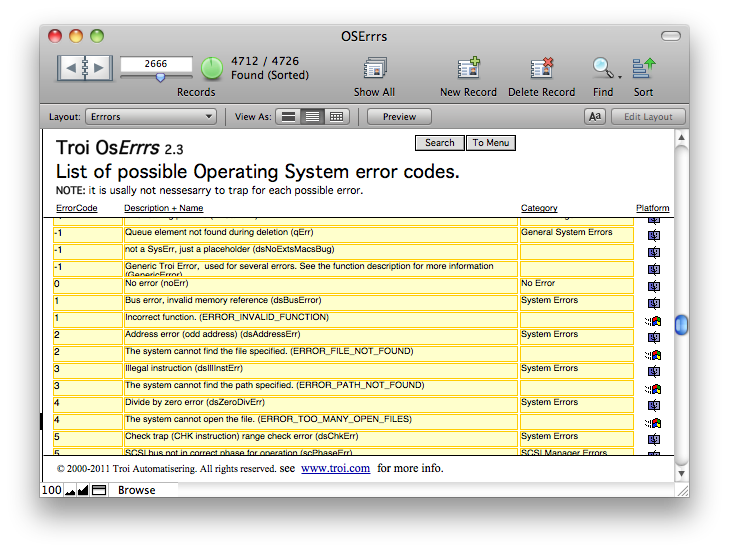 Troi OSErrrs is a FileMaker database which lists over 4700 error codes, many with their explanation. All current macOS and Windows error codes known to us are listed in this database. Some of these errors might be returned by one of our plug-ins (but of course not all!) Also error codes specific to Troi Plug-ins are listed. Troi OSErrrs 2.5.3 is formatted for FileMaker Pro 12 to 17 and adds new error codes that can be returned by Troi Plug-ins. Troi OSErrrs 2.5.3 is free! If you want to add the OSErrrs database to your solutions or want to host OSErrrs on your network, you can request the master password to the OSErrrs database.